First things first. This product is a blatant case of false advertisement, so much that I almost wrote a scathing letter to ICE when I bought it. 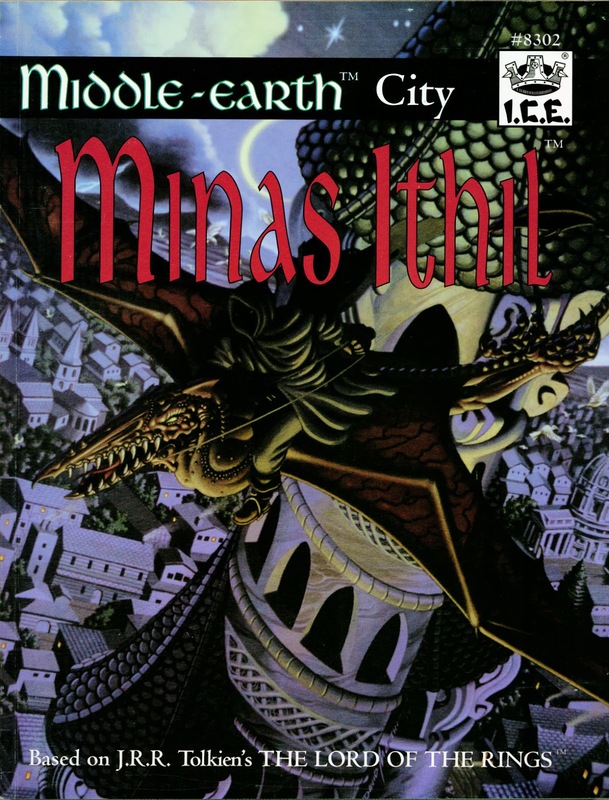 Its cover broadcasts a winged Nazgul, promising the horrors of the 2002-3018 period, and just because it's not called Minas Morgul doesn't mean the unwary can't be fooled. City modules are large (not to mention expensive), and there's no reason why both the Ithil and Morgul periods wouldn't both be covered -- in the same way that Isengard accommodated both Gondor's and Saruman's occupation of Orthanc, and that Moria included the Balrog horror. Packaged in plastic back in the day, there was no way to skim through and see you were getting shafted. Everyone wanted Minas Morgul. To reiterate my frustrations about Minas Anor, there's only so much detail required out of a "friendly" city for gaming purposes, and to pass up the opportunity of mining every nook and cranny at the Tower of Black Sorcery borders on incompetence. We thus end up with the curious embarrassment of one city module that falsely advertises with its title ("Minas Tirith") and this one which criminally misleads with its cover, an implicit acknowledgment on ICE's part that its choice of the 1640 period was less than wise. "The Tower of the Moon, introspective and peaceful, stood opposed yet complementary to her warlike and robust sibling across the Anduin, Minas Anor. The royal businesses of commerce and government took place at the Tower of the Sun, while Minas Ithil housed the mind and soul of Gondor... Minas Ithil was a center for artists, scholars, and philosophers from all Mannish lands. The Queen of Gondor ruled the city and the lands around it, using the wisdom gained through the Moon-tower's palantir to maintain order within the Morgul Vale." I adore the Rynd Paramhyrrath in particular, run by a fascist head librarian who throws people out on a whim, and where priceless works from Numenor, dangerous theories about the Kin-Strife, and untranslated scrolls in Black Speech are stored, and of course inaccessible to most. There's more excitement to be mined here than even in Minas Anor's libraries, and it's not just the contents that make it more compelling. Minas Anor tends to approach the arts and scholarly endeavors as investments and ornamentations more than anything: "While Anorian artists are busy painting portraits and building busts to commemorate their patrons, those of the Morgul Vale are experimenting with light and perspective to find new ways to view the world." 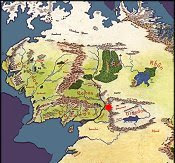 In the aftermath of the plague, Minas Ithil is ruled directly by the queen just as the new capital at Minas Anor seats the king, and while Mirien didn't live as long as her record-holding husband Tarondor (1636-1798), she had a solid reign nonetheless (until 1727), and so the module has about a century's leeway of applicable time period. For that matter, with few alterations, it could be used until 1856, when the city becomes mostly a garrison town. Fascinating is that legal authority counts for rather little in Minas Ithil, with political power coming from oratory skills and honorific status. High charisma and master-manipulating skills get you far here. As in Minas Tirith, the building layouts are vast and anorexically precise, though again it feels like so much effort being expended on so little. The Tower of the Moon is obviously essential, as is the Queen's Palace, and the University, and the arena for popular entertainment, and few other noteworthies, but most of this is just stuff DMs don't need drawn out. I'm probably in the minority in preferring the architecture of this city over Minas Anor's famous hill which grows out of the back rock; Minas Ithil's main road winds up and around in complete circles, yielding seven "levels" in effect, but blurring together more seamlessly. I'm not going to pretend that Minas Ithil's appeal can mitigate the crime of standing for what should have been Minas Morgul. But for its purpose it does well, and in the long run warms my heart more than Minas Tirith, which is very ironic considering how much I cursed and gnashed my teeth over it. Next up: Dagorlad and the Dead Marshes.